The following understanding of Sura Kafirun was written on July 5, 2008, almost five years ago and now, on this day February 09, 2013, it is being dedicated to Pastor Bob Roberts for his bold take on respecting the otherness of others. Kafirun is a Chapter from Qur’an that addresses the believers (of other faiths) in the most dignified way, putting everyone on par without denigrating any. It is an exceptional example of civil conduct for one to follow. Nowhere in this chapter is a claim made that the faith of Muslims is superior to others, or others’ faith to be inferior. Throughout the chapter, the other is treated respectfully as an equal, “I do not worship what you worship, and you do not worship what I worship” – it does not say your worship is inferior to mine. The element of arrogance was not given a room in this chapter. Because you hold a different belief, your belief is not belittled. This chapter is about consciously nurturing civility in societies. It is not about overlooking the differences and focusing on commonalities, it is simply about accepting the otherness of other. You are who you are and I am who I am, and let’s figure out how we can co-exist with the least tensions. This is the basis of pluralism – i.e., respecting the otherness of others. I believe all religions are beautiful and none is graded to be superior or inferior. I may not believe what others believe, as others may not believe what I believe. I will accept them for who they are, as they would accept me for who I am. I will not disrespect any faith, as it amounts to arrogance, and God simply does not like anyone who is arrogant, indeed, arrogance is the root cause of all conflicts. Arrogance kills the very spirit of society – Justice, peace and equality. Islam is about live and let live. Learning to accept and respect others’ right to exist and figure out the best way to co-exist. A majority of Muslims get this right, and few don’t, indeed that is the case with every religious group. As the saying goes “beauty is in the eyes of the beholder” I would add “faith is in the heart of the believer.” As a person of faith, your and my role is to mitigate the conflicts and nurture goodwill among peoples and nations. That brings peace, and that is the other word for Islam. In another chapter, God essentially says, I have created ya’ll from a single couple, and made you into many tribes, communities and nations. Each one of you is different and unique with your own thumb print, DNA, taste bud and behavior bud. He also said had I willed I would have punched you all out from a factory template to exact specifications, all males to be precisely same height, weight, color and same with the females. But I chose to make you unique and gave you complete free will to create harmony and cohesiveness within and with what surrounds you. Then he concludes, the best one among is you is the one who learns about each other. Knowledge leads to understanding and understanding to acceptance and appreciation of the other resulting in harmony and peace. What does submitting to God’s will mean? Just as we love the food we cook, enjoy the results of the work we do, God loves his creation and likes everyone to get along. God’s will is that we care for the life and environment and lead a just life that leads to a state of peace and harmony for his creation. That’s the bottom line; that is what Jesus meant when he said “follow me” or Krishna said ““surrender to me”. The following chapter in Qur’an does not say, that others’ belief is inferior, in fact it says, as your belief is dear to you, as my belief is dear to me. So much respect is given to the other faith. At this time, one of the best Qur’an translations available is by Mohammad Asad and I recommend you to use it as a reference, rather than some of the mistranslations on the market. Even this translation has a few flaws in dealing with women, but this translation is better than most other translations on all other matters. I would recommend you to check out a few columns to understand the wrong doing and deliberate mistranslations of the Qur’an, both by the early European Kings to paint Islam in the bad light for their own gains and by the Muslims after the fall of Ottoman empire to egg on Muslims to support their cause, you also see a piece on origins of Islamophobia. There was a movie made by Geert Wilders and he continues to dupe the Neocons (Literalist or sticklers in every faith) by quoting 14 verses from Qur’an as hateful, indeed they are, because they are not in Qur’an. This blog – www.Quraantoday.com is dedicated to clarify false statements recycled every day about Qur’an. Finding the truth is your own responsibility -when you remove the ill-will from your heart, it brings freedom, salvation, nirvana, mukti, moksha, nijaat and true liberation. 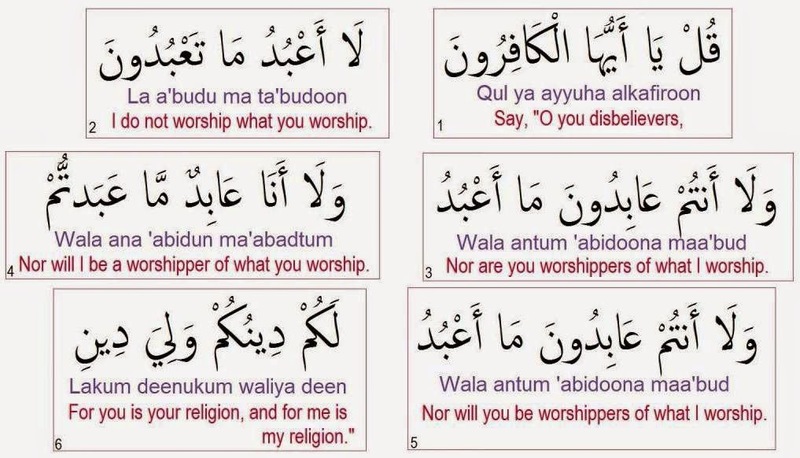 Now here are the 6 beautiful verses of Quran… Indeed, I am blessed to use this language in dealing with differences. 109:1 SAY: “O you who deny the truth! My understanding: Addressing those individuals who denied the truth spoken by the Prophet. Islam is about free will and accountability to keep the harmony of creation intact. If someone compels you to believe, pray, eat or wear, then it is not Islam. Quran is clear many many times – no one bears the burden of others. For societal equilibrium we all agree to do certain things and give up certain things as a part of living and culture. Please note, this good material for teaching pluralism and civil dialogue. Mike Ghouse is a Muslim committed to understand, explore and share the idea of Rabbul Aalameen, the creator, nourisher and sustainer of the Universe, taught to us by the Mercy to mankind who was respectful of others, and whom people trusted for his integrity, honesty, civility and truthfulness. He believes if you follow God’s guidance and Prophet’s examples, you ought to be Mukhlooqul Aalameen – human being for the goodness of mankind. More about Mike at www.MikeGhouse.net and www.TheGhouseDiary.com. Who owns the word “Allah” ?